The first Bank Holiday in May and we decided to take a trip to Wales. Previous expeditions over this weekend have proved a bit hit and miss with the weather, this year was no exception to that rule. 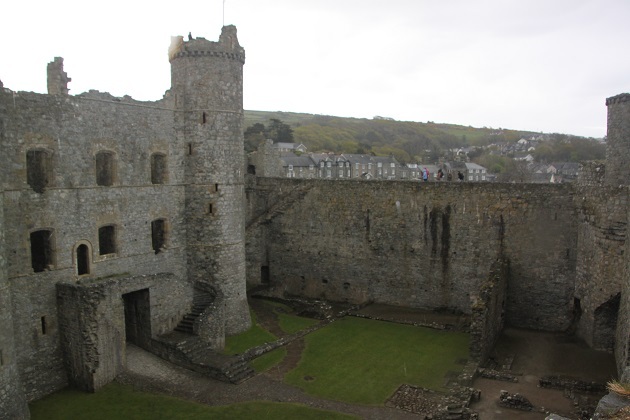 Our first port of call was Harlech Castle. 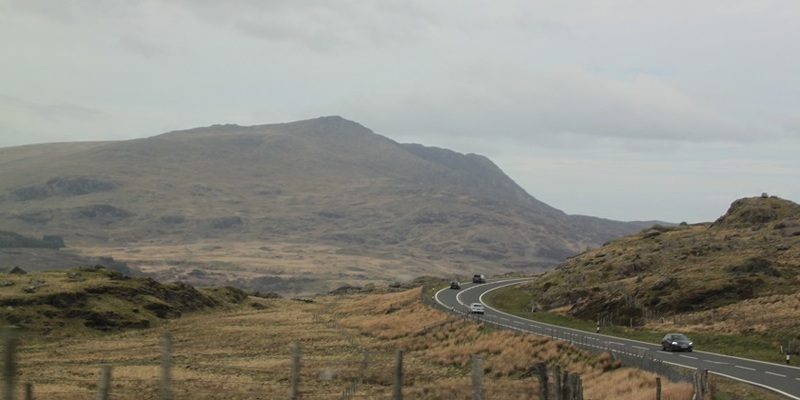 We drove through incredibly beautiful scenery and the Snowdonia National Park to get there, just a shame the weather was wet, cold and entirely miserable. The deeper into Wales we drove, the worse the weather became. Mid way through the journey we were shivering at 5 degrees centigrade, it warmed up to a balmy 8 degrees as we arrived in Harlech. Could this really be May we wondered and grumbled as we climbed out of the car in search of the castle. 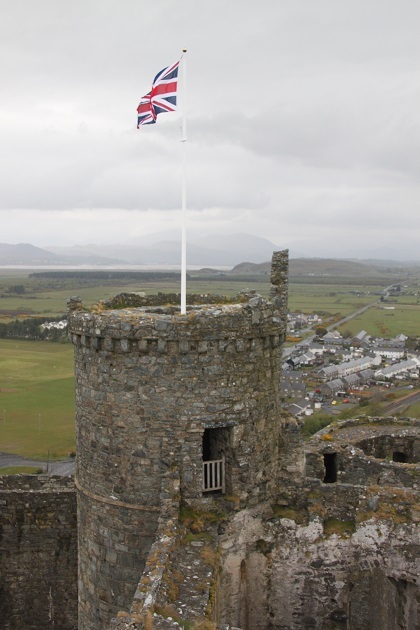 The castle is easy to find, it dominates the little town of Harlech and those mighty ruins can be seen for miles around. The history is dramatic too and definitely worth reading before a visit. The sea once crashed at the rocks below this fortress, now though it is land locked as the sea receded in the 19th century. 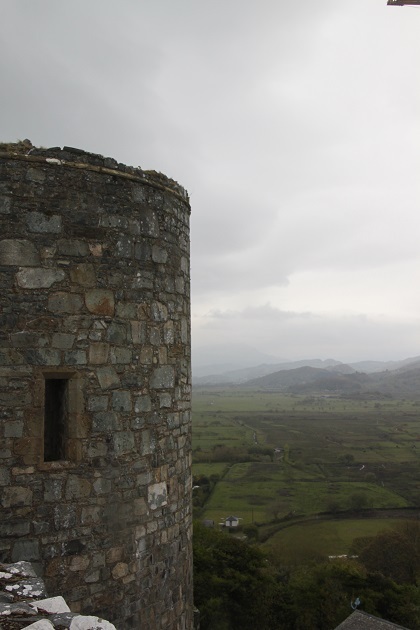 It is still a spectacular location, wonderful views over the coastal flatlands and to the rugged peaks of Snowdonia. 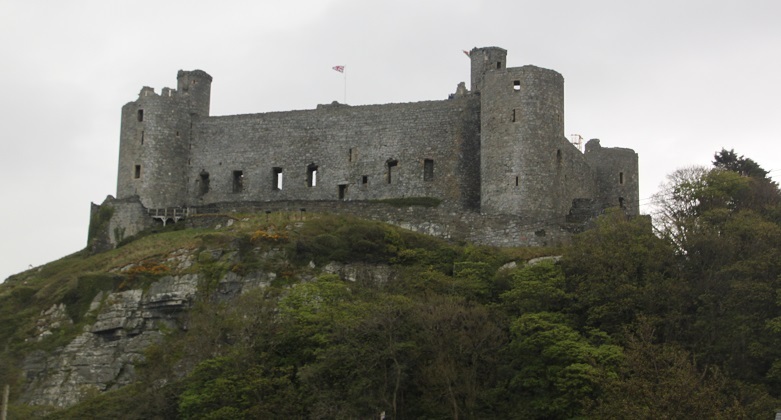 The castle was completed in the 1290’s, the brainchild of Edward I it was designed to hold down the conquered Welsh. Apparently it has been dubbed the “Castle of Lost Causes” as it has been defended unsuccessfully many times. 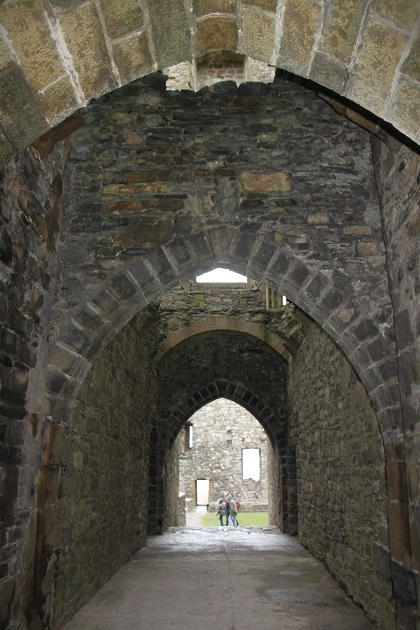 We paid our entrance fee and stepped inside armed with leaflets and information about the castle. 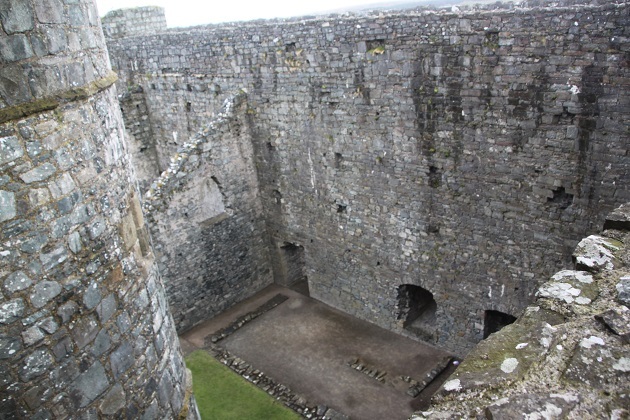 Stunning to say the least, it is perched on a high crag with a gatehouse and round towers and those incredible walls. Substantially intact – we saw the moat, gates and portcullises, you even to this day get the feeling of a very mighty fortress. We adored exploring. 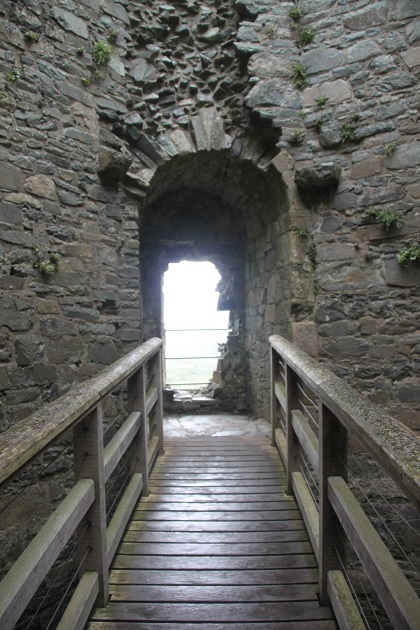 The turreted gatehouses and ramparts are ripe for climbing and clambering. Many signs everywhere advising of dangerous drops and to keep children under control – I don’t think my nerves could take it here with very little ones. I would suggest keeping them handcuffed to you – no other option would feel like the safe one for me here. 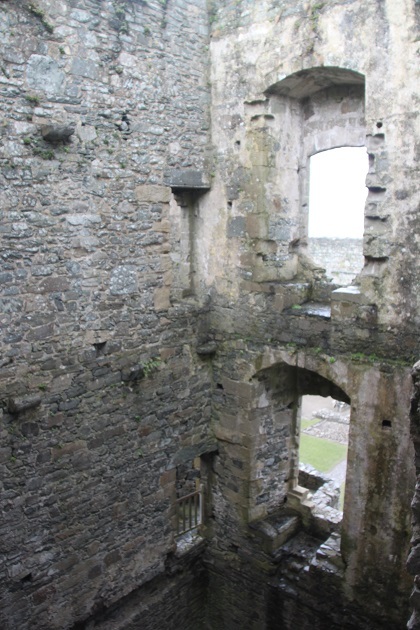 We climbed lots of winding stone staircases, walked the walls and took in those views. After about an hour we left the castle and stopped for ice-cream at a little place just opposite. We watched as the man made chocolate ice-cream then decided on different flavours for our cones. All very delicious, we ate them huddled in another doorway to shelter from the driving rain. Only in the UK…. 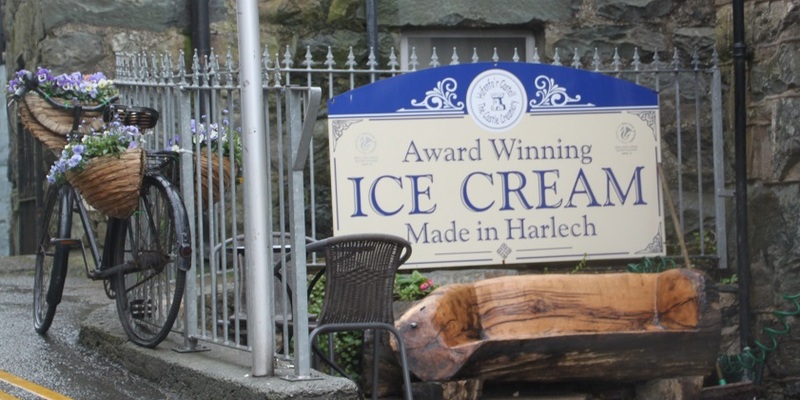 Harlech is a pleasant little town, every other shop seemed to be either selling tea or antiques. It was very sleepy though and a lot of places were closed. Maybe it bustles a bit more in summer. We ended our day with a drive to the beach. 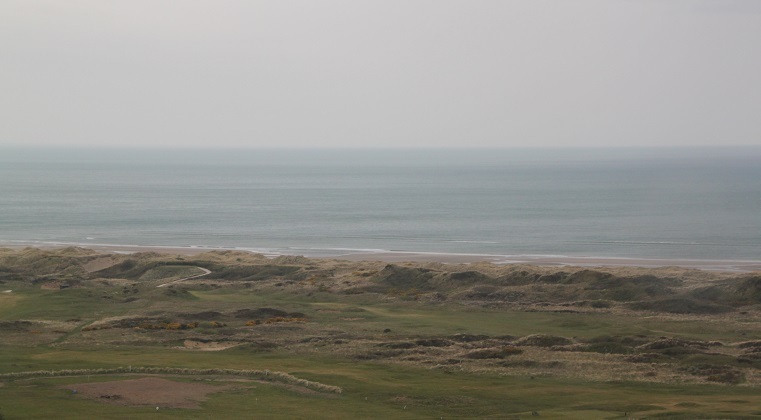 The golden sands are 4 miles long and it looked like a superb spot for a walk – towering dunes and the sand looked clean and flat. Apparently there are many jellyfish in the bay here and sometimes you can see leatherback turtles offshore hunting these creatures. We weren’t so lucky – the wind, driving rain and freezing weather drove even the humans away from the beach. Still, good views of the castle from down here too. Yes, that weather does look quite poor but us Brits know how to have fun. Even an ice-cream! 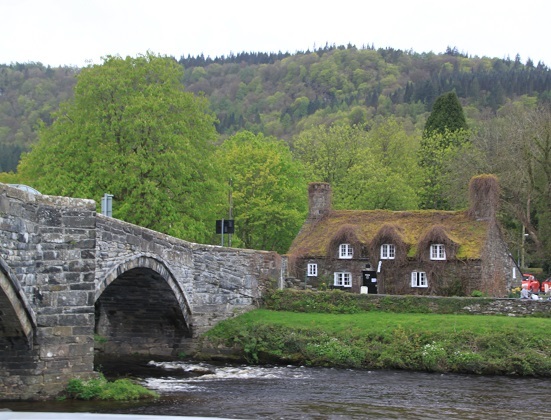 Love the thatched cottage, extremely picturesque. 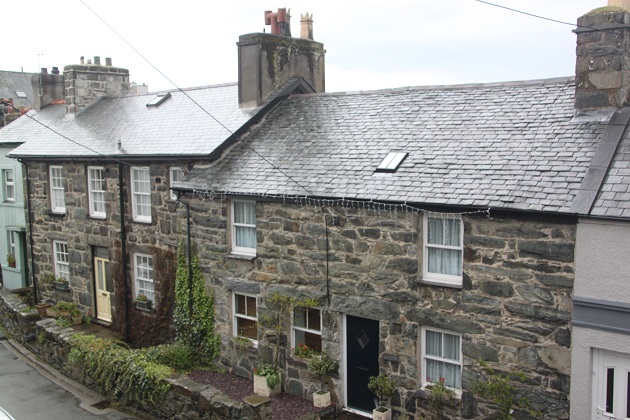 It’s so quaint isn’t it and so green around it – but then with all that rain not surprising. 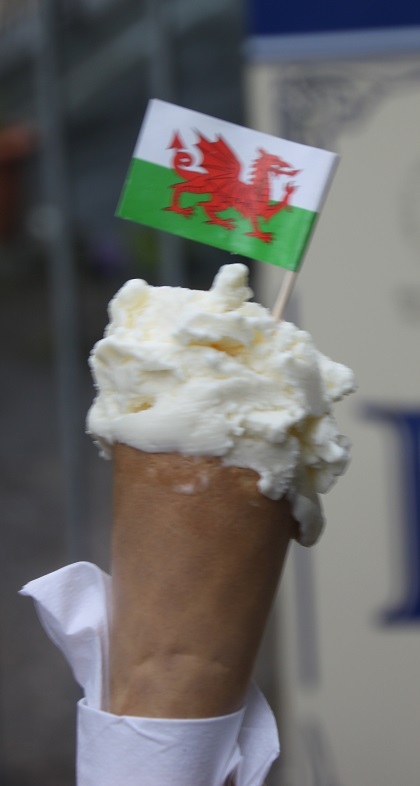 Ice-creams are a must for us – whatever the weather!! You should know that it always rains in Wales. 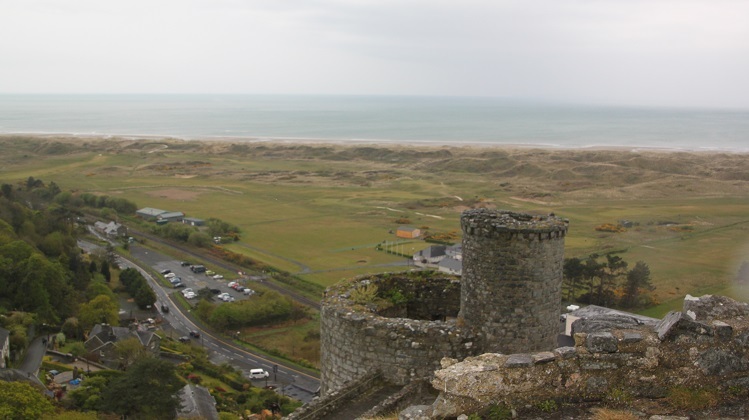 I am going next week and Harlech is on my list of things to do. It is one of my favourite castles. One thing I do know is that for sure it always seems to rain when we’re there and not just light drizzle either!! 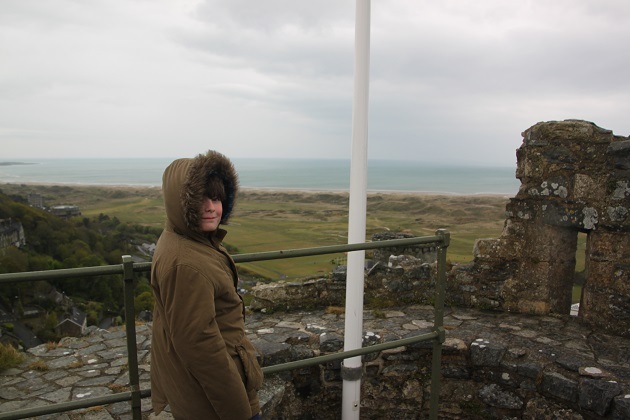 That said we did love Harlech and the surroundings. Hope you have a good time and some sunshine! 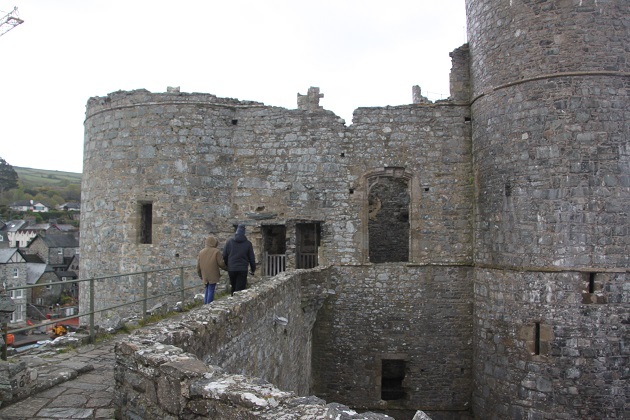 It is a spectacular castle – still intact and so much to see and explore despite all that rain!! 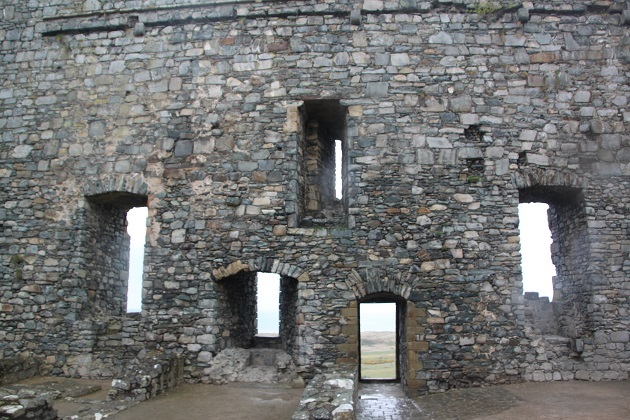 Harlech and it’s castle still look stunning despite the awful weather but I’m glad to see that you were not deterred and enjoyed your day out despite the rain and wind. I haven’t been there but have visited Snowdonia a couple of times in the past. I’ll try and visit one day when we’re in that area! It’s a wonderful castle, the location is stunning and the castle itself is very impressive with loads of nooks and crannies to explore. Despite the weather we had a great day there! Our son will eat ice-cream in any weather – even snow!! Sometimes we figure if you can’t beat them join them!! Our son will eat ice-cream whatever the weather – this time we decided to join him!! You’re right though, the weather is so unpredictable here you can’t wait for sunshine to get out and explore. We did have a great day out despite the wind and rain!! Talk of so much rain makes me miss the UK! Love Wales. Exploring castles never stops being magical either. This one really was magical – incredible history and so scenic as well….. we just could have done with a bit less of that rain!! The sort of castle I love – more than the ones with fancy state rooms that we’ve been visiting lately. This was the same weekend we were in Northumberland – we were luckier with the weather. Cold but bright and only a little bit of rain. The elements were definitely against us that day – wind, rain and more rain but somehow seeing the castle on a gloomy day made it even more atmospheric. It is incredible, rugged, intact and so impressive. 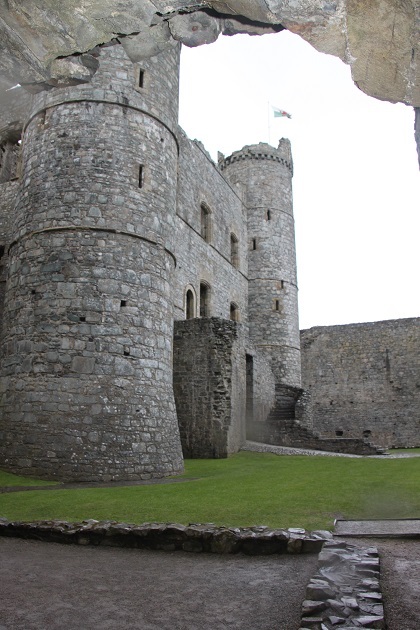 Adding Harlech Castle to my travel list! It’s a great place, loads of history, a stunning location and those incredible ruins (mainly intact) – we had a wonderful day out. 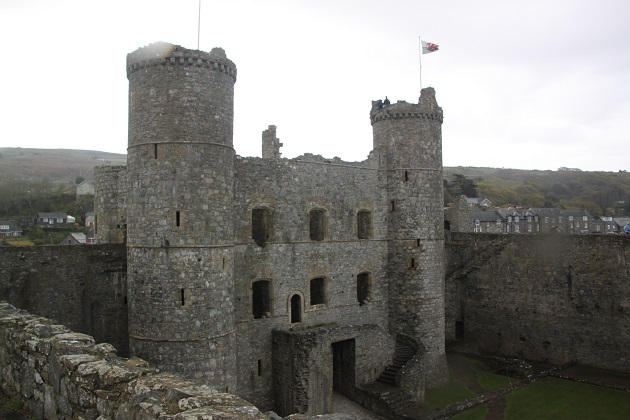 The Castle of Lost Causes maybe but it hosted the longest siege in the history of the British Isles, there’s even a song written about it called ‘Brave Men of Harlech’. They ventured o’er the border! Vict’ry’s banner floateth o’er us! Sung with gusto at rugby matches right!! Joy, thanks for the castle tour. I can never get enough of churches and castles and the lovely British Isles are perfect for both! 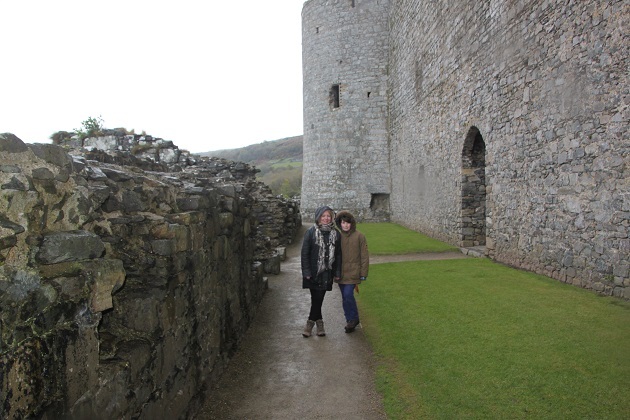 We were in Wales last year and loved it! 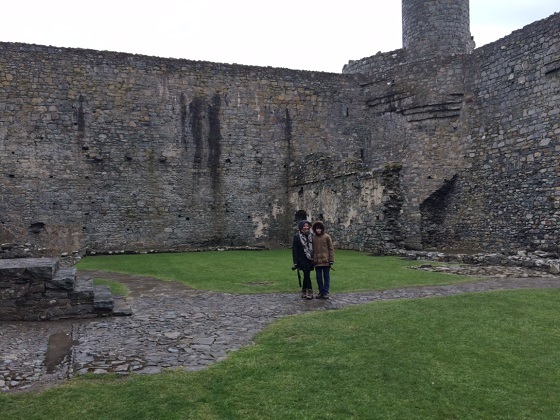 Wales certainly has plenty of castles Pam, hope you got to see some good ones!! We would have preferred sunshine for exploring this one but still had a great day. I love those old castles that are just a shell–you can do so much imagining then! This one definitely makes imagining easy! The castles are splendid Suzanne – just would be nice to have a little sunshine to enjoy them better!! Our son believes ice creams are for any weather Rosemary, this time we decided to join him! The weather was really terrible, possibly even worse than it looks on the pictures but we did still have a great day out, if a bit soaked and freezing at the end! Despite the almost wintry like conditions, a stunning place to visit. 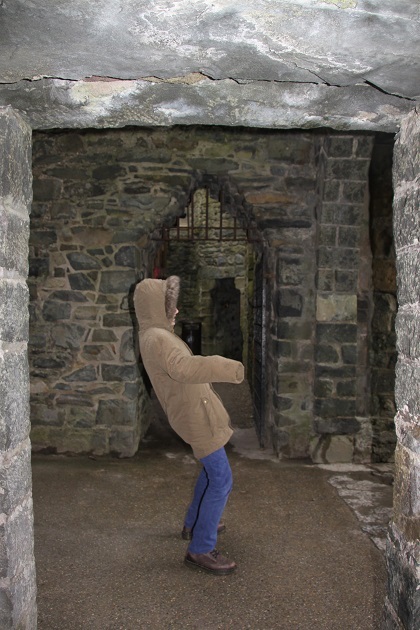 It’s a very magnificent castle with so much interesting history and fun to explore – wintry is exactly the right word though!! So pretty!! And love the sign about children! I loved the sign too but it was not exaggerating – sheer drops everywhere, not for the faint hearted. Absolutely – they’d be over the edge in 5 minutes!! Very true, the grey day definitely made it very atmospheric – no ghosts that we saw though, maybe they didn’t like the rain!! Your Wales weather looks a lot like our current Vancouver weather. When we travel we often bring it with us – sometimes we joke that we should rent ourselves out as rain-makers to drought stricken places! It just means we have to work a bit harder to be sunny on the inside. All of the Martinis are in support of your “gelato regardless of wind or rain” philosophy, but Miss G is shocked that you passed up the chocolate! 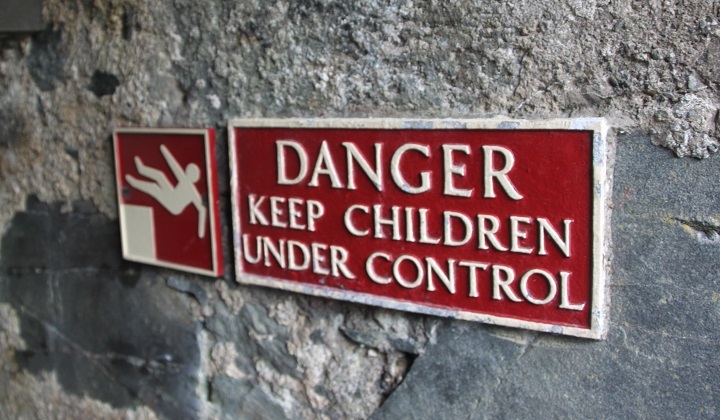 (I love your shot of the “control you children” sign… I am going to print it out for my office!) Thank you, as always, for sharing! Our son went for the chocolate ice-cream – that is a must for him, it was just the “oldies” who didn’t!! We have similar problems with the rain, it does seem to follow us a bit too and that is what we are having right here at the moment as well. Summer doesn’t seem to have realised it needs to be here now!! The sign is great isn’t it, I loved it too but here they definitely weren’t exaggerating!! Spectacular sounding castle. I hear you with the weather. We had some of that when we were in northern England last year. Sounds like you needed the tea more than the ice cream. 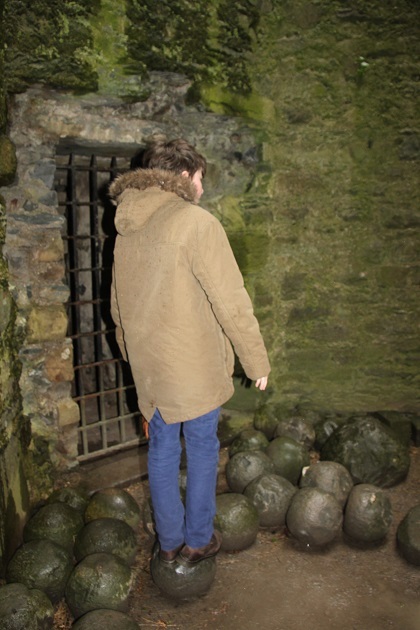 Wales is really interesting and I wish to go back to explore a bit more and why not this castle ! What a coincidence!! We didn’t stop for drinks there but I couldn’t resist pulling in and taking a picture, I thought the little house was so cute. Sounds like it’s even more gorgeous in autumn – we’ll have to go back! 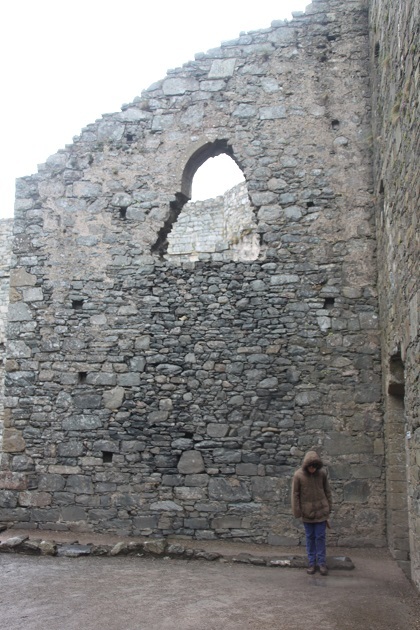 This is a great castle – lovely location by the sea and incredible ruins, we loved it.